Is the offer as much of a bargain as you think it is? Online sales orders originating from Ireland soared by 635% in November 2017 when compared with the normal monthly average. This indicates clearly that Ireland has fully embraced the global sales event. But as retailers prepare for a bounce in business around the Black Friday weekend this year, consumers should tread carefully as they get bombarded with offers and ads encouraging them to part with their cash. So, what do people need to watch out for? 1. The main one is around security and data protection. 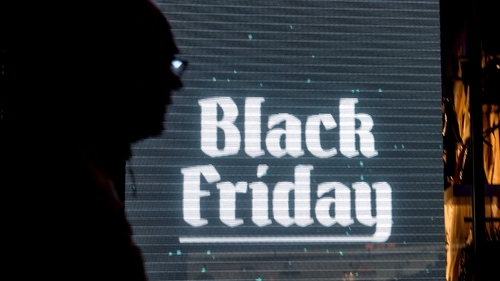 British cyber-security agency GCHQ has warned that Black Friday is being targeted by malicious figures looking to take advantage of online shoppers. That might include an increase in attempts of phishing, where scammers try to trick individuals to part with their passwords or financial information. This is often done by imitating legitimate companies or websites via email or text message. 2. Another thing to be wary of is attempts to trick people into buying something for more than its worth. The classic example being people who are duped into paying big money for an iPhone box online, having not spotted the small print in the ad that says there's no phone inside. It might seem like a simple scam to avoid, but amid the panic to secure a bargain mistakes like this can easily be made. 3. Overall the advice is for people to be very careful when clicking on links in emails, and check website addresses for online shops to ensure they are not just fake sites that are made up to look like legitimate retailers. Scammers will often attempt to trade off the reputation of legitimate companies by imitating their online presence, but offering an inferior product or service. If in doubt, double check where you're looking to buy from with a simple online search. 4. Also, keep an eye on your online banking or bank statements over the next few weeks just in case there's any suspicious activity; even if it's just a tiny amount of money that you've been duped out of. The sooner any discrepancies are identified, the easier it is to resolve them. If you notice any payments that shouldn't be there, then get straight on to your bank and/or retailer that the issue is with. 5. But it's not just out-and-out scams people should watch out for - you should also take care to ensure the bargain you're being offered is actually a bargain. A big part of the Black Friday event is that it's a time-limited sale, so people are pressured into buying now, because they might not get such a good deal next week. Of course when you do the research, you can often find that you're not getting much of a discount at all or that another retailer is offering you the product at a better price. Don't be afraid to shop around and take your time in making sure you're actually getting as good of a deal that you think you are. 6. Consumers should also be wary of being upsold alongside impulse purchases. For example, the Central Bank yesterday published research on gadget insurance and it found that the majority of people who took this type of cover out did so as an add-on to a new phone or tablet that they'd bought. The study also found the majority of those buyers didn't really know what they were buying, because the information wasn't made clear to them at the point of sale. Feel free to question any add-ons and find out exactly what you are getting if you pay for them.